Nice folks from a wide variety of backgrounds. It’s home to people from more than 140 countries speaking 224 different identified languages. 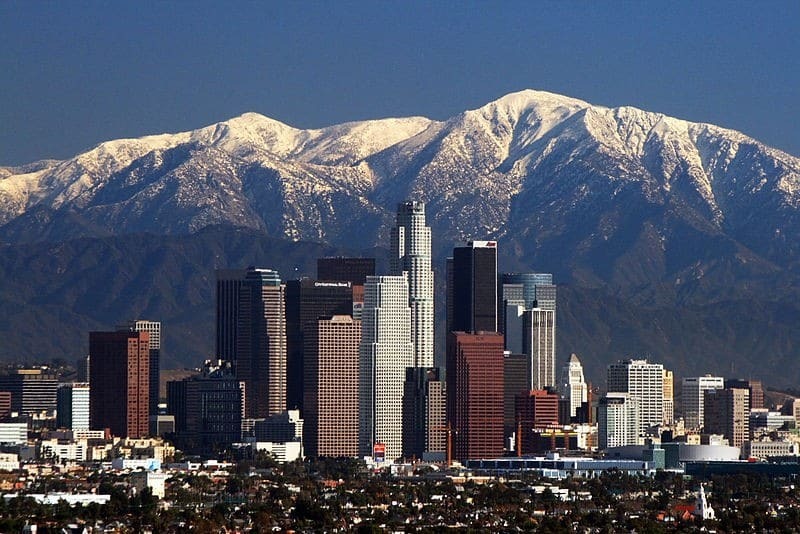 Los Angeles–It’s a melting pot. French meets Southern food and German style deli, and Pacific Rim meets Mexican. This is where a lot of our fusion favorites come from. 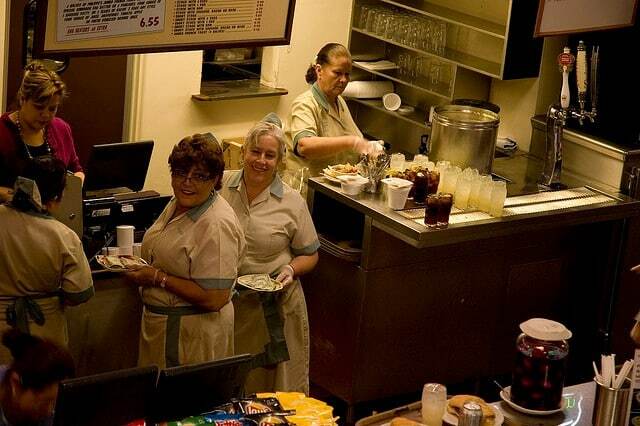 Today at this no frills diner/deli the French dipped sandwich comes in many variations: roast beef, roast pork, leg of lamb, turkey or ham. Cheese offerings include Swiss, American, Monterey Jack or Blue Cheese. Accompaniments include cole slaw, potato and macaroni salads, pickled eggs, Kosher style dill or sweet pickles, and black olives and hot yellow chili peppers. Note: they only accept cash. These beef rolls, originally from the northeastern Chinese province of Shandong, consist of a crisply fried, flaky wheat pancake smeared with hoisin and filled with thin slices of marinated beef, cilantro, and scallion. At $6.75 the huge roll at 101 will easily feed two people. A small cafe in a mini-mall next to a bowling alley, 101 Noodle Express doesn’t look like much, but they usually come in first in the hotly debated topic of “which is the best place in LA to get a Shandong beef roll”. Note: they only accept cash. There is much debate over the origin of chicken and waffles (Southern fried chicken served with French waffles topped with syrup and melted butter). Some claim that it started with Thomas Jefferson bringing a waffle iron back from France in the 1700s and others that it was never a popular Southern dish but was developed by African Americans who had moved up North. 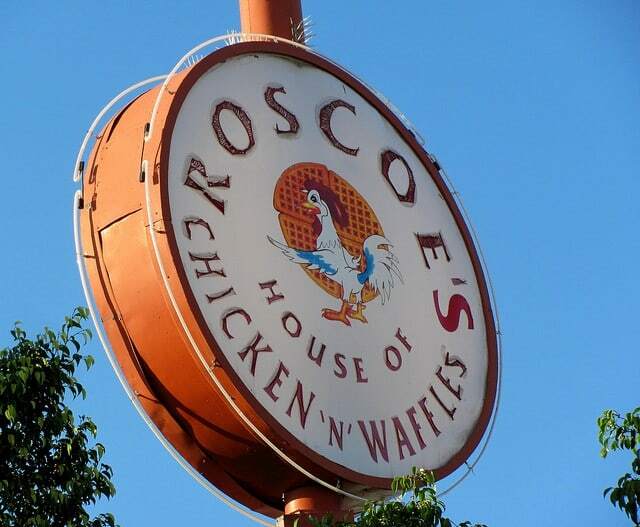 Two things are certain though, it was popular in Harlem by the early twentieth century and it was brought to mainstream culture by Harlem expatriate Herb Hudson’s restaurant, Roscoe’s House of Chicken and Waffles in Hollywood during the 1970s. Celebrities such as Natalie Cole and Red Foxx have raved about it, it is mentioned in Quentin Tarantino’s “Jackie Brown”, and the Notorious B.I.G. raps about it in “Going Back to Cali.” If you aren’t tempted by the chicken and waffles this oasis of soul food has lots more to offer: grits, fried chicken livers and giblets, Southern biscuits, greens and potatoes smothered in gravy, cornbread, candied yams, red beans, mac n’ cheese and lots, lots more. In a city of fusion tacos a stand out is the Vietnamese taco–a twist on the better known banh mi sandwich. Instead of a baguette why not a tortilla? This fusion is the result of a different kind of marriage–the one between Chef Jose Sarinana and Xoia Vietnamese Eats owner Thien Ho. They weren’t planning on selling tacos, but it occurred to them as a use for the excess beef from making pho broth. After simmering in broth spiced with cinnamon and star anise the beef is shredded and served on white tortillas with cilantro and chopped onion and served with Mexican chile de arbol salsa on the side. They also have Vietnamese hot wings and chicken curry tostadas. Not feeling adventurous? Don’t worry you can get classic Vietnamese banh mi and, of course, Pho. Korean-Mexican fusion? Oh yeah . . . How ’bout some spicy kim chi, or chicken or tofu marinated in red chili vinaigrette, or barbecue short ribs wrapped up in a flour tortilla. In LA Koreatown borders Latino neighborhoods in Mid-City. Food culture has long merged, but it took chef Roy Choi (formerly of Le Bernardin in New York and RockSugar in LA) to bring it into popular culture. Kogi first started on Thanksgiving 2008 peddling $2.00 short rib tacos: “two crisply griddled homemade corn tortillas, double-caramelized Korean barbecue, salsa roja, cilantro-onion-lime relish and a Napa Romain slaw tossed in a chili-soy vinaigrette.” In six short years Kogi’s Korean tacos have become ab LA classic. Make sure you are ready to stand in lines that have been know to last over an hour. Combine first three ingredients in a slow cooker on high for about 6 hrs. or low for about 10 hrs. Remove meat from bone and shred with two forks. Serve on tortillas topped with kim chi, chopped scallions, sesame seeds, salsa, cilantro, and/or lime. There is a chicken and waffle place here in downtown Raleigh and there is always a line. It’s so awesome though! Thanks so much for sharing, Happy Monday!